Turkey's not even on the table yet but this holiday deadline is quickly approaching so we thought we'd share this fun contest. 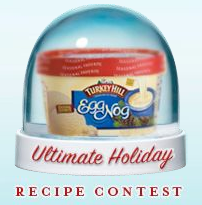 Turkey Hill Dairy is hosting the Ultimate Holiday Recipe Contest. In honor of their holiday ice cream flavors, Egg Nog and Peppermint Stick, they are asking all you ice cream fans to concoct a recipe using either one of those flavors. The recipe can be anything you want it to be…ice cream cupcakes, a yummy frothy drink, a layered cake, whatever your sweet tooth desires. Only rule is that Turkey Hill’s Egg Nog Ice Cream or Peppermint Stick Ice Cream be an ingredient. So start the brainstorming and show us what you got. Send your recipe to Turkey Hill at icecreamjournal@gmail.com by December 1 (we know its days away on a busy holiday weekend, sorry for the last minute!). And we here at Scoopalicious would love to see what you do so feel free to send it to us too and maybe you'll be a spotlight on our blog with your great recipe. So what do you get for all this hard work? If chosen as one of the best recipes you will be featured on the Turkey Hill website and will receive a one month’s supply of ice cream. And if you are one of the best of the best, that is one of the top four recipes – two for Eggnog and two for Peppermint – you'll get a feature story for just yourself on Turkey Hill's blog, the Ice Cream Journal (http://icecreamjournal.turkeyhill.com), from December 8-11. The fun part is that the blog's visitors will then be able to vote for their favorite recipe and that winner will receive a year’s supply of Turkey Hill ice cream! WOW…all these prizes…what's not to love. Good luck! So I subscribe to the 20x200 mailing list. 20x200 is an awesome project by Jen Beckman. The 20x200 site says it best: "On a Sunday night back in January, Jen came up with a formula: "(limited editions x low prices) + the internet = art for everyone." The concept is fabulous. I have been busy out in Minnesota with my nephews, coloring and watching movies, and now that four-year-old Evan is napping I had a minute to check my email and I found a print I just needed to post about about. This week's print is Kevin Cyr's Koolman -- an ice cream truck! What could be finer? The unfortunate part is that I got to this a little late, and only the bigger sizes are available. All 200 of the $20 size (8.5"x11") is sold out, so our only remaining options are to spend $200 on one of the remaining 14 (out of 20) 22"x17" prints or $2,000 on one of the two that measure 30"x40"...even the $200 print are going fast so I'd act now if you just have to have one...(I'm hoping Husband reads this post before they sell out -- otherwise he's stuck contacting Mass College of Art grad (yay Fenway area art schools!) Kevin Cyr to see if the original 24"x48" oil on plywood is still available. For more of Cyr's fabulous work, visit his website. Cold Stone has certainly been all over our blog in the past couple of days, with contests to win and cakes to taste. Visit your local participating Cold Stone Creamery from 6-9 tomorrow (Monday) for a tasting of their cakes and pies. While you are there, pick up a cake for Thanksgiving, and enter to win! Note: I got this in my email because I am on the Cold Stone Creamery mailing list. I am not sure if this is only in Massachusetts and New Hampshire or all over, because I can't find the event on their site. You might want to call ahead to confirm whether this event is happening in your area. Another piece of cake...ice cream cake, that is! Today I got an email from Cold Stone Creamery. 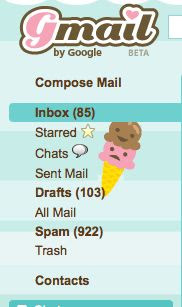 Before I got into that, I do want to point out that Gmail now has themes, and if you use Gmail and choose the "candy" theme, you will have a cute little ice cream staring at you every time you check your mail. And if you are like me, that would be all the time... oh! oh! And if you choose the "bus stop" theme and make your location Boston, you also have a kid holding a huge (um, "dream" might be a better word) cone down at the bottom. Oh, and wait...one more digression. I am on my computer that doesn't have Adobe Creative Suite on it and I am too lazy to go upstairs and use Photoshop, so I just wanted to mention this super cool online photo editing site I just read about. Picnik. Great for on-the-go editing! All over the news, I am hearing about bailout this and bankrupt that. Apparently Cold Stone Creamery isn't having these problems, because they have a contest this holiday season with a chance to win up to $10,000 when you buy one of their cakes. Sweet! Cakes and money! (Although right now I can't even begin to think about ordering a cake because I ate too much Party Favors cake at a reception at the Museum School's Art Sale, InsideOut.) Anyway, $10,000. How could I get away from that? Without further ado, here is the $10,000 news! Now through January 6th, 2009 (or sooner, if they run out of game pieces), purchase a Cold Stone cake and get a "gold medal." With this gold medal, you have a chance to win one of three $10,000 prizes, five $500 prizes, or one of 1000 cakes! Even the smallest prize has some sweet potential! Anyway, this is an ice cream filled post along with a couple of hot tips, so I hope between this post and Tina's yesterday, we are getting out of the dog house for being kind of MIA. Speaking of $10,000...er, um, at least 10,000 lakes...I will be in the land of 10,000 lakes (Minnesota) next week but hopefully will be able to report back on some midwestern ice cream. Ice cream cake that is....what will they come up with next? There is something so wrong about this but something so right! Baskin Robbins has come out with a new festive cake, the Turkey Ice Cream Cake. According to their site, this creative cake can be made with the ice cream flavor of your choice (their favorite is half chocolate half vanilla to re-create the dark meat and light meat effect) which will be glazed in chocolate and caramel. The legs are actually sugar cones with a caramel top glaze. Now if this isn't a conversation starter for those awkward family gatherings I don't know what is. I totally want this...its hysterical and a cake to never be forgotten! When I came across this one in David Lebovitz's book, A Perfect Scoop, I knew I had to try it or at least make it for Scott. He loves Guinness beer and luckily we usually have a few cans on hand so that makes it even easier. I first tried this at Bethany's Ice Cream Party and absolutely loved it. It is velvety and rich with a slight hint of Guinness. Even if you aren't in love with beer, the mild taste is intriguing and oh so good. I have now made this twice. First time I made it it was super creamy and I actually ate this before completely frozen (having friends over for dinner and of course made it last minute) but it was equally as good. So the second time I didn't have as much luck but I think I know what I did. 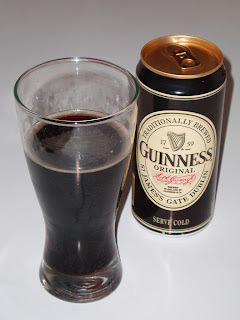 As I mentioned my husband is fond of Guinness so I thought I'd do him a favor and add more beer for added flavor. Big mistake! Adding more alcohol affects how the ice cream willl freeze so this batch was icier and did not freeze so well. Stick to the original recipe on this one and you can't go wrong. It's a perfect winter flavor to sit on the couch and indulge in! Stir the mixture constantly over medium heat with a heatproof spatula, scraping the bottom as you stir, until the mixture thickens and coats the spatula. Pour the custard through the strainer over the milk chocolate, then stir until the chocolate is melted. Once the mixture is smooth, whisk in the cream, then the Guinness and vanilla. Stir until cool over an ice bath. New Feature: Spice Dish Saturday! A while back the oh-so-fabulous Cakespy introduced us to EB of SpiceDish...with that introduction, we found a new friend, a charming person, and a ice cream maker a la mode! (ok, I just made up that expression -- what I am trying to say is she is AWESOME.) 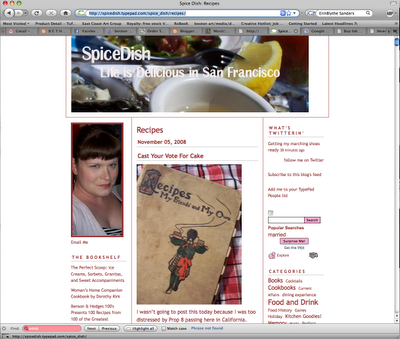 After following her wonderful blog and all the recipes she creates and/or tries, Tina and I had a wonderful idea -- let's invite SpiceDish to be a monthly guest blogger. So we asked and she said "yes!" How lucky we are! Without further ado, here is the first installment of SpiceDish Saturday! This is an ice cream for the adults out there who find themselves pulling melted skittles out of their carpets, bubble gum wads stuck in sox and new cavities in their kid's heads. This is a treat to that will use up that bit of pumpkin you have leftover from muffin making, the dregs of cocoa you haven't made hot chocolate with and what's leftover in those pumpkin heads full of 'fun-size' candy bars. It may feature kid-sized candy bits but its flavor is most decidedly adult. The deep chocolate base with a hint of vegetal pumpkin flavor both spiced by cinnamon is decadent all by itself, but the candy bits bring back those holiday memories. In a saucepan add the milk, sugar, cocoa and salt. Heat while whisking until it froths up. Turn off the heat and add the pumpkin. Stir in. Chill until cold then freeze in your ice cream maker. 5 minutes before it is finished churning add the candy pieces. Enjoy! We will enjoy! Thanks EB and welcome! Beautiful photos courtesy of EB of SpiceDish as well! For the first time in the history of this blog, we are telling you to put the ice cream eating second. Just for today. First thing today, go out and vote. On your way back from the polls, head over to Ben & Jerry's to get your free scoop! Happy Election Day! May the best flavor win! Can you tell its the countdown to this Tuesday's big festivities at the polls. 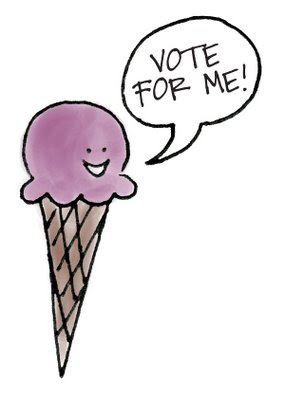 Yeah we know, we are an ice cream blog but we are amazed at how many connections ice cream has with the election and its our civic duty to keep our fellow bloggers informed. Today we give you the answer you've all been anxiously awaiting (I know sitting on the edge of your seats I am sure!). A few weeks back we posted about the fun online election, Flavor Debate 08, that our friends at Baskin Robbins were having in honor of the Presidential Election. Just to give you some background in case you missed that post, the flavor debate was between Obama's "A Whirl of Change" ice cream (Peanut-Nougat ice cream whirled with chunks of chocolate-covered peanut brittle and a caramel ribbon) and McCain's "Straight Talk Crunch" ice cream (Caramel ribbon, chocolate pieces, candy red states and crunchy mixed nuts swirled into White Chocolate ice cream). Baskin Robbins stores across the nation had each flavor on hand and polls were open in stores and online throughout Sept/Oct to vote for your favorite flavor. And that people did. Baskin Robbins had nearly half a million people vote, and just as we expect Tuesday's race to be, it was way too close. Now that was tight! Well this election was truly a yummy one. More instant gratification in this race but Tuesday's election has long term effects so if you didn't get a chance to vote in this tempting election you definitely must get out and vote this Tuesday.